But something seemed white unusual this time with Beyoncé not closing but opening the red carpet with Francesco Scognamigilio feathery dress that made her look like Ice Queen very appropriate for the coming winter time. Celebrity hairstyles at VMA 2016 vary from extra short pixies to long wet effect hairstyles. Let me show you it all now. It is not strange at all that hairstyles on the red carpet are becoming more and more casual each time, With current hair trends sporting naturalness these ordinary ponytails make sense really. There were a lot of updo hairstyles last night. From top knots to ponytails, from buns to French twists. But among all them the most fascinating appears to be this look of Beyonce, with the dress itself and with the neat slicked back updo hair. Being quite critical about many looks of Kim, this one definitely like. The semi transparent short dress, the wet effect side swept beach waves look quite to the point at the music awards, and yes black and white combination with Kanye makes the couple unforgettable, as always. Center parted hairstyles were there at the awards, thus stating once again their growing popularity everywhere. Meanwhile Britney Spears shocked us with a tiny black dress that was worthy to be taken to Cannes Film Festival with its elegance and modesty. Bob haircuts are definitely not going away any day soon, and the above celebrity looks prove that bob cuts rock now and will in the coming year of 2017. 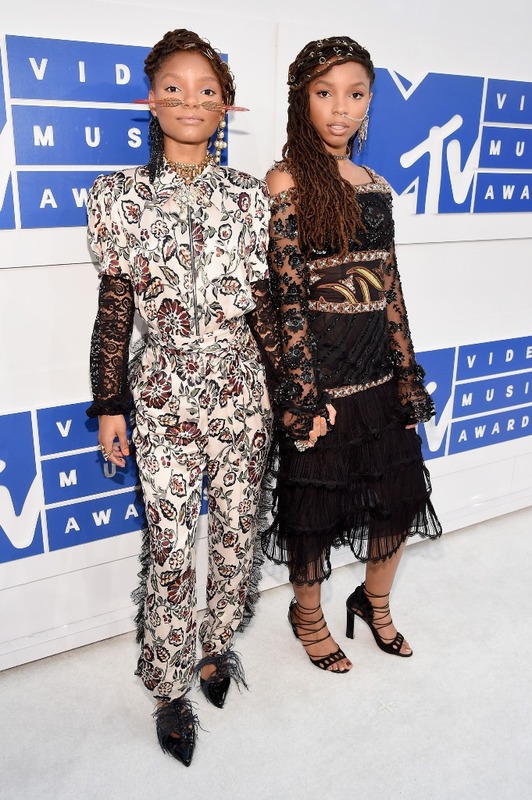 Looking authentic and not forgetting about roots is taken to all new heights at VMA where Chloe and Halle appeared with female dreads hairstyles looking original and really nice.